ASEAN+3 Bond Market Guide is a comprehensive explanation of the region�s bond markets. It provides various information such as the history, legal and regulatory framework, speciic characteristics of the market, trading and transaction including settlement systems, and other relevant information. 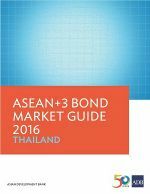 Bond Market Guide 2016 for Thailand is an outcome of the strong support and kind contributions of ASEAN+3 Bond Market Forum members and experts, particularly from Thailand. The report should be recognized as a collective good to support bond market development among ASEAN+3 members. Total local currency bonds outstanding in Thailand increased 2.5% quarter-on-quarter (q-o-q) and 10.3% year-on-year, reaching THB12,445 billion (USD385 billion) at the end of the fourth quarter (Q4) of 2018. The government and corporate sectors both posted quarterly increases, with the former expanding a more rapid 3.3% q-o-q compared with the latter�s marginal increase of 0.5% q-o-q. Corporate debt sales in the LCY bond market in Q4 2018 amounted to THB356 billion, reflecting a decline of 22.2% from the third quarter. The financial sector had the largest share of newly issued bonds in Q4 2018.